PRODUCTION TECHNIQUES: A careful selection of Sangiovese grapes is performed in the 2nd week of October with traditional techniques and then macerated for 3 weeks. After racking and malolactic fermentation, the wine is placed in new French oak barriques, 20% of which are new, for 24 months. After this period it is blended and bottled after necessary treatment. COLOUR: Deep ruby red with garnet nuances. BOUQUET: Intense, very complex, with hints of red fruit, cherry and plum, combined with spicy notes of coffee, cocoa and cinnamon. 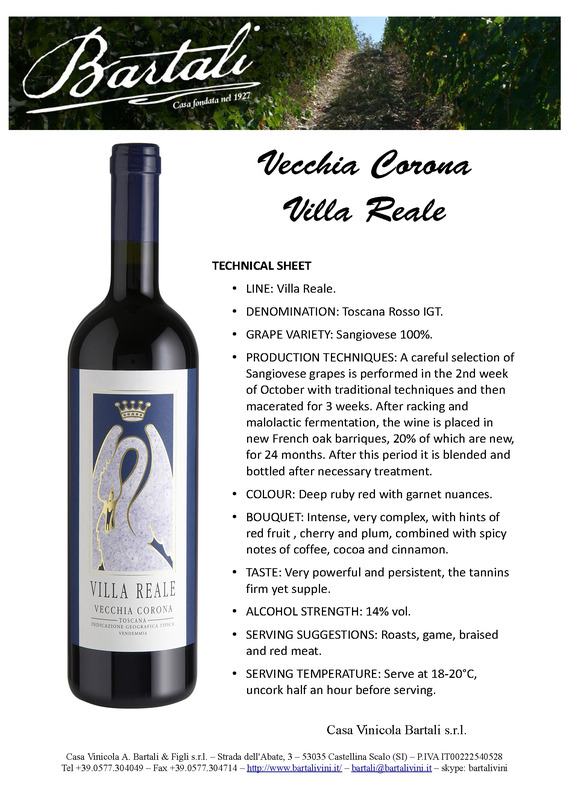 TASTE: Very powerful and persistent, the tannins firm yet supple. SERVING SUGGESTIONS: Roasts, game, braised and red meat.